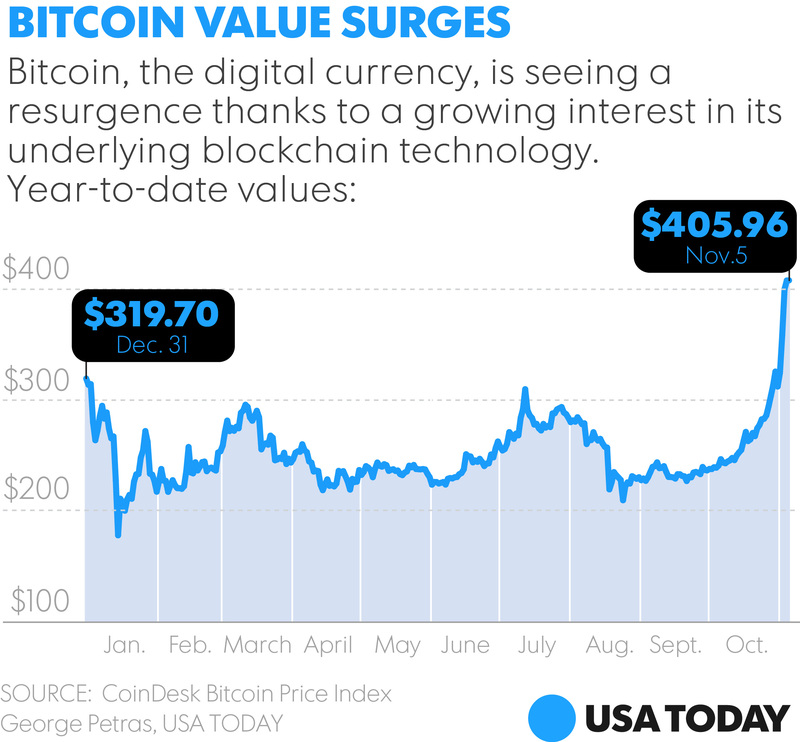 NEW YORK — Digital currency bitcoin broke the $400 mark for the first time this year on Tuesday — and Wall Street is betting it will go even higher. Brokerage firm Wedbush Securities said it sees the cyber coin costing $600 per bitcoin in the next 12 month, citing growing interest by large financial institutions in bitcoin’s underlying technology, known as blockchain. Bitcoin, which has been used to buy everything from cars to computers to illicit drugs, traded at $404.50 per bitcoin Thursday afternoon, according to bitcoin data tracker Coindesk. On Tuesday, the digital currency broke the $400 mark for the first time since last November, up more than 50% from January. It’s been a rocky road for bitcoin enthusiasts, who watched the cyber money rise to almost $1,000 per bitcoin in late 2013 before the world’s largest bitcoin exchange, Mt. Gox, collapsed in 2014. Mt. Gox’s collapse pummeled bitcoin’s reputation, and it was blasted the worst investment of 2014 after falling a whopping 58%. But bitcoin appears to be gaining momentum once again — jumping to as high as $485 per bitcoin Wednesday on Coindesk — amid signs of growing interest in its transaction technology, known as blockchain. On Tuesday, Magister Advisors, which advises on tech mergers, said the world’s top 100 financial institutions are projected to spend an estimated $1 billion on blockchain-related projects over the next 24 months. 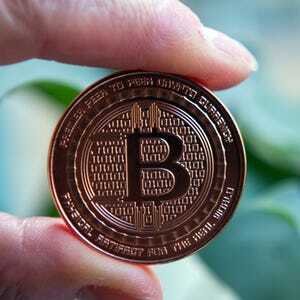 The U.K.-based firm also said it sees bitcoin becoming the 6th largest global reserve currency within 15 years. The currency is also being boosted by European Union’s move in October to define bitcoin as a currency rather than a commodity for tax purposes. But Wedbush suggested future gains will be pegged to investments by Wall Street firms, such as Goldman Sachs and the New York Stock Exchange, which have said they are looking at blockchain technology as a way to help them conduct financial transactions safely and cheaply. “We believe bitcoin and its associated blockchain technology have the potential to disrupt the existing financial infrastructure over the next several years,”Wedbush said in the report that set the $600 price target. And while the blockchain ledger system can be used separately from bitcoin, Wedbush sees interest in blockchain boosting bitcoin as well. “We believe there may be some applications that narrowly use a distributed ledger without a valuable native token, but those will end up being a small part of the solutions,” Wedbush analysts wrote.